In response, Saudi energy minister Khalid al-Falih announced that “Saudi Arabia is temporarily halting all oil shipments through the Bab al-Mandab Strait…until the situation becomes clearer and maritime transit through Bab al-Mandab is safe.” In theory, Riyadh could use the Petroline pipeline (which has a capacity of 5 million barrels per day) to bypass the strait and deliver the affected 500,000-700,000 bpd of crude further north to Red Sea export terminals at Yanbu. Yet the fact remains that attacks by Iranian-backed Houthi militants continue to disrupt traffic in the world’s third-most important shipping strait after Hormuz and Malacca, at a time when Tehran has warned that any U.S. sanctions on its oil exports will push it to cut off all oil exports from the Persian Gulf. But if Bab Al Mandeb is blocked that oil must go to Europe via the Suez Canal and/or Sumed pipeline, not to Asia. LONDON (Reuters) – A Saudi oil tanker hit by Yemen’s Houthi group on Tuesday was the vessel Abqaiq, the EU naval force said on Wednesday. The tanker was in international waters west of Al Hudaydah, according to a statement by the Saudi coalition spokesman, Col. Turki al-Malki. He did not disclose the extent of the damage but called the assault “a serious threat to the maritime navigation and international trade” in the region. Secretary of State John Kerry said the missile deployment was at odds with a pledge made by Mr. Xi while visiting the White House last year to refrain from militarizing clusters of disputed islands throughout the South China Sea. The U.S. military released a video Saturday showing what it says is an Iranian military vessel firing several unguided rockets near the aircraft carrier Harry S. Truman and other Western warships and commercial craft. The incident occurred Dec. 26 in the Strait of Hormuz. Navy officials released the video to Military Times in response to a Freedom of Information Act request. The images show what appears to be an Iranian Revolutionary Guard vessel firing rockets from a distance of about 1,370 meters. Officials with U.S. Central Command first disclosed details about the incident last month. Approximately 20 minutes before the incident occurred, the Iranians had announced over maritime radio that they would be carrying out a live-fire exercise, officials said. Although the rockets traveled away from the Truman, firing weapons “so close to passing coalition ships and commercial traffic within an internationally recognized maritime traffic lane is unsafe, unprofessional and inconsistent with international maritime law,” said Cmdr. Kevin Stephens, a spokesman for the U.S. Navy’s Fifth Fleet. Iran had dismissed the U.S. claim as “psychological warfare” against the Islamic Republic. “The Guard’s Navy had no drills in the vicinity of the Strait of Hormuz and didn’t fire missiles or rockets during the past week and the time claimed by the Americans,” Gen. Ramezan Sharif, a Revolutionary Guard spokesman, said on the Revolutionary Guard’s website. The United States has confirmed that Iran tested a medium-range missile capable of delivering a nuclear weapon, in “clear violation” of a United Nations Security Council ban on ballistic missile tests, a senior U.S. official said on Friday. Its decision, which has been welcomed by environmental campaigners, follows disappointing results from an exploratory well drilled 80 miles off Alaska’s north-west coast. Shell said it had found oil and gas but not in sufficient quantities. Iranian supreme leader’s top foreign policy advisor Ali Akbar Velayati said on Friday that Iran will not allow IAEA inspectors into any military sites, Iranian news agencies Mehr and Fars reported. Velayati’s declaration contradicts JCPOA, the nuclear agreement Iran signed two weeks ago with world powers. Annex I of JCPOA, the nuclear agreement between Iran and P5+1, allows inspection of military sites. Iran could refuse IAEA’s request to inspect any specific site, but an eight-member Joint Commission comprising the U.S., Iran, EU, UK, Russia, China, France and Germany can with a majority (5) vote overrule Iran’s objection. The process could take up to 24 days, but the inspection will have to be allowed if the Joint Commission votes in its favor, not particularly too high a bar for the U.S., EU, UK, France and Germany representatives to meet. If Iran indeed refuses to verify the inspection provisions of the agreement, it could throw the implementation of the entire agreement in limbo. The implementation begins with IAEA certification that Iran has implemented all its obligations under the agreement. 26. The EU will refrain from re-introducing or re-imposing the sanctions that it has terminated implementing under this JCPOA, without prejudice to the dispute resolution process provided for under this JCPOA. There will be no new nuclear related UN Security Council sanctions and no new EU nuclear-related sanctions or restrictive measures. The United States will make best efforts in good faith to sustain this JCPOA and to prevent interference with the realisation of the full benefit by Iran of the sanctions lifting specified in Annex II. The U.S. Administration, acting consistent with the respective roles of the President and the Congress, will refrain from re-introducing or re-imposing the sanctions specified in Annex II that it has ceased applying under this JCPOA, without prejudice to the dispute resolution process provided for under this JCPOA. The U.S. Administration, acting consistent with the respective roles of the President and the Congress, will refrain from imposing new nuclear-related sanctions. Iran has stated that it will treat such a re-introduction or re-imposition of the sanctions specified in Annex II, or such an imposition of new nuclear-related sanctions, as grounds to cease performing its commitments under this JCPOA in whole or in part. 51. The IAEA will establish a baseline for the amount of uranium legacy from past enrichment operations that will remain in Fordow. Iran will permit the IAEA regular access, including daily as requested by the IAEA, access to the FFEP in order to monitor Iran’s production of stable isotopes and the absence of undeclared nuclear material and activities at the FFEP for 15 years. 74. Requests for access pursuant to provisions of this JCPOA will be made in good faith, with due observance of the sovereign rights of Iran, and kept to the minimum necessary to effectively implement the verification responsibilities under this JCPOA. In line with normal international safeguards practice, such requests will not be aimed at interfering with Iranian military or other national security activities, but will be exclusively for resolving concerns regarding fulfilment of the JCPOA commitments and Iran’s other non-proliferation and safeguards obligations. The following procedures are for the purpose of JCPOA implementation between the E3/EU+3 and Iran and are without prejudice to the safeguards agreement and the Additional Protocol thereto. In implementing this procedure as well as other transparency measures, the IAEA will be requested to take every precaution to protect commercial, technological and industrial secrets as well as other confidential information coming to its knowledge. 75. In furtherance of implementation of the JCPOA, if the IAEA has concerns regarding undeclared nuclear materials or activities, or activities inconsistent with the JCPOA, at locations that have not been declared under the comprehensive safeguards agreement or Additional Protocol, the IAEA will provide Iran the basis for such concerns and request clarification. 6. Iran will provide to the IAEA access to the locations of intended use of all items, materials, equipment, goods and technology set out in INFCIRC/254/Rev.12/Part 1 (or the most recent version of these documents as updated by the Security Council) imported following the procedure under Section 6 of this Annex. “We expect to see an increase in borrowing,” he said, according to a report in the economic daily Al-Eqtisadiah newspaper over the weekend. Analysts have estimated a deficit of about $130bn this year. The government, which had not tapped bond markets since 2007, has been dipping into its large foreign reserves, which peaked at $737bn last August, to sustain spending on wages, special projects and the Saudi-led air war on Yemen. It has drawn down $65bn since oil prices fell. Bonus payouts for state employees and the military made by the new king, Salman bin Abdulaziz Al Saud, have placed further pressure on state coffers. “Reality is hitting home, and necessity is also hitting home,” said John Sfakianakis, director for the Gulf region at Ashmore, a fund manager. Saudi Arabia needs an oil price of $105 a barrel to meet planned spending requirements, but the average price for the year is estimated at $58 a barrel, he said. “If the government continues business as usual and draws down like this it will deplete reserves faster than expected, by the end of 2018 or early 2019,” added Mr Sfakianakis. 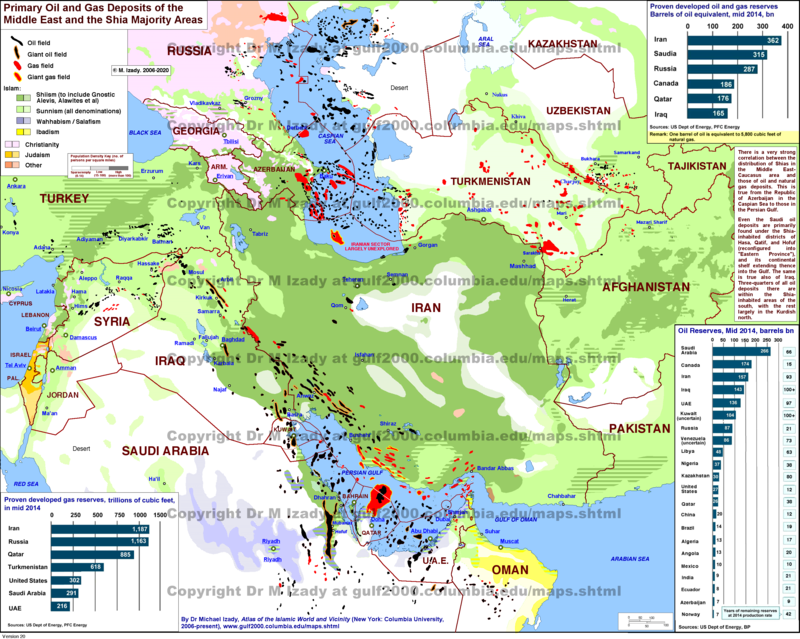 Given the unparalleled domestic and regional threats and amassed enemies facing the Saudi regime and its kingdom, it might only be a matter of time before the targeted Saudi Shi’a or one of the other Saudi regime’s enemies, such as ISIS, Al-Qaeda, Al-Houthis or the Muslim Brotherhood, decide to blow up one of the massive and vulnerable oil facilities in Eastern Saudi Arabia where oppressed Shi’a and Western expatriates work and live. Thousands of miles of oil pipelines, as well as scores of storage tank farms, refineries, oil fields, harbors and the expansive oil administrative headquarters in Dhahran are easy targets despite the vigilance of Saudi and foreign security forces. If this scenario were to occur, it’s more likely than not that the US will use its Persian Gulf naval and ground military might to ensure the defense, production and shipment of oil to the world’s markets in order to prevent global economic meltdown. The question is at what price to the Saudi people, to the US and other oil consuming powers? Can a costly military intervention by the US to protect oil be minimized or avoided? Potentially, yes, if the Saudi oligarchy is willing or can be induced to embark upon doable political reforms so that all citizens (regardless of religion, race, region or gender) are legislatively empowered to participate in all aspects of their country’s affairs, including all decision-making processes, disposition of the country’s wealth and the formulation and execution of domestic and foreign policies. Yemen’s Houthi fighters fired missiles at storage tanks at an Aden refinery on Saturday, starting a large fire, and 14 people were killed in clashes between the Houthis and Saudi-led forces near the southern port city, witnesses and residents said.